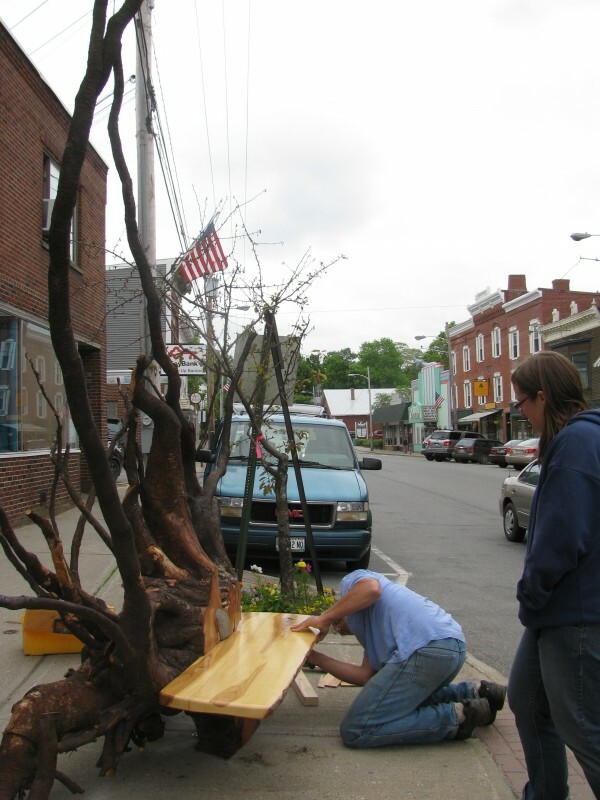 Artists Peter Proeller and Patty King, both of Rockland, work Saturday, June 16, 2012 to install a new bench called "Elemental Earth Street" on High Street in Belfast. The bench — made of the root system of a blown-down cherry tree - is part of Belfast's summer "Please, Be Seated" project. BELFAST, Maine — As two Rockland artists and a group of helpful passers-by toiled Saturday morning to arrange what appeared to be a large root system in perfect position on the High Street sidewalk, it wasn’t immediately clear that the end result was meant to be relaxing. But once the hard work was done, Peter Proeller took a minute to try out the “Elemental Earth Seat” he and Patty King had made. “It’s comfortable,” he said, looking slightly relieved. It was just another day in the installation of this summer’s edition of “Please, Be Seated,” a street art project that seeks to dot the downtown with creative versions of benches and chairs. The version, or vision, of a bench dreamed up by King and Proeller is also affectionately known as “Rooti-Tutti” by the artists. It is the root system of a blown-down cherry tree that landed in Proeller’s yard. They lugged it out, varnished spots, sanded “here and there” and removed much of the dirt. King said she hopes that people traveling through town this summer might see the roots rising next to Alexia’s Pizza and have a moment of looking at things in a different way. “Using your imagination,” she said. Proeller added that he thinks the art installation, run by Our Town Belfast, adds something fun to the streets. Elaine Bielenberg, the coordinator of the art project, said there will be 30 chairs and benches placed throughout the city this summer. Twenty are new art projects and 10 are returning from last year, and all will have been installed by the end of next week. Some local businesses, including Cold Mountain Builders of Belfast, have sponsored the different seating arrangements. The building firm is sponsoring the Elemental Earth Seat. By Saturday afternoon, visitors were already taking a break and sitting down for a few minutes in the benches and chairs that already have been put in place. “I think it just adds to the warmth and charm of Belfast,” Bielenberg said.